Today, the Colorado is one of the most controlled rivers in the world providing recreation and irrigation for a wide area along its 1,450-mile length. P.A. 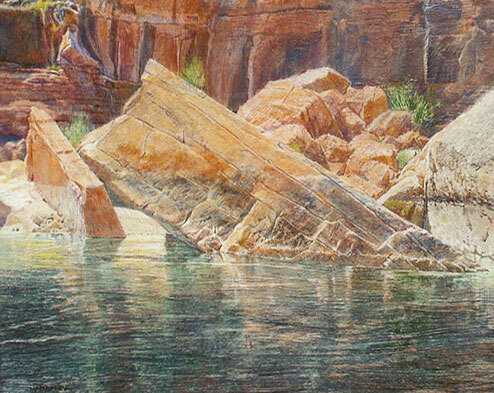 Nisbet spends long hours in the Grand Canyon and remote regions of the West, hiking, camping, and painting. His painting, Morning on the Colorado, captures a quiet stretch of the river as it continues to grind down the Grand Canyon. The painting epitomizes his passion for the landscape, which he describes poetically: “When I imagine the story of my own life, I see only this: A vast chromatic distance, a layered, transparent landscape, and a journey without a destination through great vaults of stone, light and space.” Morning on the Colorado won the Henry Farny Award for Best Painting at the 2009 Quest for the West exhibition at the Eiteljorg Museum in Indianapolis, Indiana. Merrill Mahaffey, Unstable Rocks, acrylic on canvas, 36" x 46". Courtesy Duley-Jones Gallery, Scottsdale, AZ. Unlike Lt. Ives, who was singularly unmoved by the majesty of the Colorado, Louisa McElwain identifies with the landscape of the West. She responds to the sensuality of the landscape as well as to the sensuality of paint itself. She has a feeling of oneness with her materials and her subjects. Louisa McElwain, Canon, oil on canvas, 12" x 36". Courtesy Evoke Contemporary, Santa Fe, NM. Diné artist Shonto Begay was born on a Navajo Reservation sheep camp in Arizona. His name, in Navajo, refers to “light reflecting off water.” Light plays a big role in Begay’s paintings and is represented by his characteristic swirling application of paint. In Night Wash, Indian women, water, stone, and sky appear to be made of the same substance. Solid elements seem to dissolve into the mist and clouds in one spiritual creation. Shonto Begay, Night Wash, acrylic on canvas, 24" x 12". Courtesy Medicine Man Gallery, Sante Fe, NM and Tucson, AZ.